Newtonville, Mass. – In each of the past two seasons, Newton North's quest for a Division 1 state softball championship has fallen a bit short. Two years ago, the Tigers lost an extra inning affair to Lexington in the North sectional final. Last season, they succumbed to eventual state champ Milford in the state semifinal. To come oh so close, yet finish on the losing end, can wreak havoc on one's psyche. But for the Tigers, that is not the case. Following Saturday's 8-5 triumph over King Phillip Regional, Newton North established itself as a predominant favorite to snare its first state crown come June. Facing the powerful Warriors, the Tigers (4-0) built, what they thought, was a comfortable eight run lead before King Phillip's offense came alive in the final inning to make things interesting. 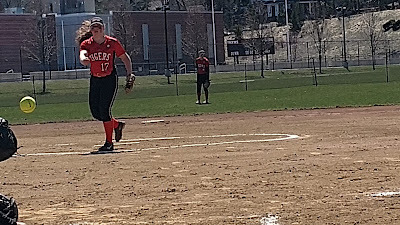 Newton North starting pitcher Mia Patriacca was unhittable over her first six frames of work before King Phillip (3-2) started to swing bats with regularity in the top half of the seventh. Having allowed five runs in the frame, Patriacca, a senior right-hander, managed to settle down by proceeding to retire the final three Warrior batters to earn the victory. All four of the Warriors' hits came in the last inning. Adhering to a vast mix of fastballs, screwballs, change-ups, drops and risers, Patriacca continued to keep King Phillip's bats silent throughout the first six frames. In the process, she also struck out six. The win marked Newton North's second against King Phillip, a three-time state champ, in a week. "We were able to do this without Kira Flegenheimer, one of our best hitters, because her back has been sore," said Tigers coach Lauren Baugher. "To be able to put up this many runs against King Phillip without Kira in the line-up is scary. I think 1 through 15 we are really good. I like how we have been hitting the ball thus far. It is only going to up our confidence after the way we hit the ball today." Scoreless through two innings, Newton North began to flex its offensive muscle in the third against Warriors starter Elise Pereira. The Tigers quickly loaded the bases. Then, with one out, Emma Arpino stoked an RBI single for Newton North's first run. A bloop single off the bat of Patriacca made it 2-0. The Tigers padded the lead to three runs following a passed ball. A few moments later, with two on, junior Mia Buen smashed a home run well-over the centerfield fence, increasing Newton North's advantage to 6-0. "We are a team that emphasizes not putting it all on one person," Bueno said. "We really try to be equal through our line-up. We just try to band together to win that day's game. Our focus is to be consistent and to be strong up and down the line-up. It has been a long wait for us but I really believe that we are going to make it far this year." With Faith Turinese now on to replace Pereira to begin the bottom of the fourth, Newton North continued its assault as it added another run, thanks to a two-out, solo home run by Izzy Antonelli. In the Tigers' half of the sixth, singles by Bueno and Tara Eldredge set the stage for Grace Markert's RBI single, pushing the deficit to 8-0. With the way Patriacca was handling the Warriors' line-up, an eight-run lead certainly looked like a sure bet. In the seventh, King Phillip showed no signs of throwing in the towel. Meghan Gorman and Liliana Rolfe opened with singles. Turinese followed with another base hitscoring Gorman. With runners now on second and third, Jess Bonner was able to reach safely on a dropped ball by Arpino at first base, sending Rolfe to the plate. Perhaps a bit frazzled by the current events, Patriacca served up an over the plate fastball to Pereira. The senior didn't miss it as she sent a fly ball over the left-centerfield fence for a three-run homer. "These girls believe in themselves and they are never going to give up," said King Phillip veteran coach Norm Beauchemin. "I thought we made a lot of good defensive plays today because they hit the ball hard. Their pitcher dominated inside the circle for the first six innings. She was very tricky, especially with her change-ups. But this is the reason why we play teams like Newton North so that it gets us ready for the playoffs. Even though we were down eight runs, the girls continued to keep their heads in the game and play hard. That is a positive we can take from this one." With things staring to unravel, Patriacca regained her composure by recording the final three outs in succession and keep the Tigers unbeaten. "In that last inning it might've been a bit of a let down but to be honest, Mia doesn't know what letdown means," Baugher said. "I think her pitches started to hang a bit and King Phillip is a really good hitting team. Even when we were up 8-0 I knew we still needed to keep the pressure on because it is King Phillip. They were able to string some hits together in the seventh but luckily we were able to make some plays in the end to win it. They didn't hit Mia until the seventh inning. She moves the ball around really well. She is excited about this season and opportunity that stands in front of her. "